Heavy cavalry is a class of cavalry whose primary role was to engage in direct combat with enemy forces (shock troops). Although their equipment differed greatly depending on the region and historical period, they were generally mounted on large powerful horses, and were often equipped with some form of scale, plated, chainmail or lamellar armor as well as either swords, maces, lances, or battle axes. 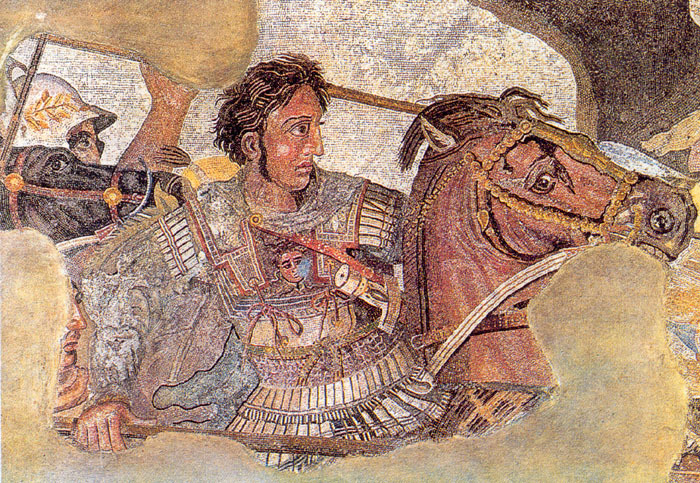 Alexander the Great on horseback. Although some form of cavalry had been in use in Mesopotamia since 3000 BC, the chariot was the predominant mobile striking force of most armies in the region. By 600 BC armoured cavalry began seeing use, though it was not until the later ancient Greek era that true heavy cavalry emerged. Assyrian cavalry during the reign of Ashurbanipal was known to have used metal helmet and breastplate, fought with thrusting spears in conjunction with bows and arrows, and rode on horses covered with textille barding, however it's unclear how this early heavy cavalry operated and performed. Iranian tribes such as the Massagetae were believed to be the originator of the class of heavy cavalry known as cataphract. During the time of Achaemenid Persia cavalry was the elite arm of service (as was the case in most civilizations), and many Persian horsemen such as the bodyguard unit of Cyrus the Younger were rather heavily armored by the standards of the era. By the time of Alexander's invasion cataphract units with both men and beasts being fully encased in armor were already in use by the Persians. The Parthian Empire of Ancient Iran marks an early recorded utilization of armored cavalry in warfare, and are specifically believed to have given rise to the tradition of very heavily armored cataphract lancers. These had a distinct role from ordinary heavy cavalry and were primarily used as an elite assault force, to pummel infantry formations into submission, or even acted in a dual-purpose role as horse archers and cataphracts. "All their companies clad in iron, and all parts of their bodies were covered with thick plates, so fitted that the stiff joints conformed with those of their limbs; and forms of the human faces were so skillfully fitted to their heads, that since their entire bodies were covered with metal, arrows that fell upon them could lodge only where they could see a little through tiny openings opposite the pupil of the eye, or where through the tips of their noses they were able to get a little breath." "The Persians opposed us serried bands of mail-clad horsemen in such close order that the gleam of moving bodies covered with closely fitting plates of iron dazzled the eyes of those who looked upon them, while the whole throng of horses was protected by coverings of leather." The ancient Greeks called armored cavalry Kataphraktos (pl. Kataphraktoi) which translated means roughly "covered, protected" or "armored". The term was later borrowed by the Romans (the Latin variant in the Roman Empire being Cataphractarii) and until the Middle Ages in Europe, continued to be used to designate armored cavalry. However as with other types of cavalry, heavy cavalry was not employed in any significant capacity in wars between the Greek city states until later, mainly due to the prevalence of hoplite warfare as well as the mountainous terrain of Central Greece. The lack of suitable grassland and excess grain supply necessary for the production of good cavalry mounts was also crippling to the establishment of an effective cavalry force, the noted Greek mercenary and writer Xenophon once saying that a horse farm was the most expensive type of establishment to keep running. The exception was in Northern Greece, where large flat areas of grassland made cavalry much more practical. Eventually, encounters with Persian cavalry led the Greeks to create their own cavalry arm, the Hippeis, composed mostly of upper-class citizens who could afford to maintain a horse. While cavalry played an increasingly greater part in Greek warfare, its roles were generally restricted to scouting, skirmishing and pursuit. By the end of the Pelopponesian War however, heavy cavalry charges has started to play an increasingly important part in Ancient Greek warfare, with the Battle of Delium showing how their intervention could turn the tide of a battle. The city state of Thebes was particularly famous for its cavalry, with the famed Theban commander Epaminondas using his heavy horse to great effect both at Leuctra as well as Mantineia to rout the Spartan cavalry, and in the process disrupting the legendary Spartan phalanx as well, helping his own to win the day. It's likely that Phillip of Macedon organized his famed Companions after the Theban model, since he spent his youth in the house of Epaminondas as a hostage. Up to the 5th century, Sarmatians cavalry units were stationed in Britain as part of the Roman army (see End of Roman rule in Britain), allowing for a direct influence of Roman cataphracts on Migration Period Europe. According to a theory of Littleton and Thomas (1978), the legend of King Arthur, the prototypical knight of High Medieval literature, was directly inspired by these Sarmatian troops (however, it is most likely that the only reason we view Arthur and his retainers as knights was simply because the Arthurian Cycle became popular in a time in which knighthood was predominant); and Sir Thomas Malory's descriptions reflect his own time, in which the plate-wearing tournament knight was again prevalent. Byzantine cataphracts were a much feared force in their heyday. The army of Emperor Nicephorus II, the 'Pale Death of the Saracens' himself, relied on its cataphracts as its nucleus, coupling cataphract archers with cataphract lancers to create a self-perpetuating 'hammer blow' tactic where the cataphract lancers would charge again and again until the enemy broke, all the while supported by cataphract archers. Contemporary depictions however imply that they were not as completely armoured as earlier Roman and Sassanid types — horse armour is noticeably absent. Byzantine cataphracts of the 10th century were drawn from the ranks of the middle class landowners through the theme system, providing the Byzantine Empire with a motivated and professional force. An experimental type of cataphract was brought to the fore in the 10th and 11th centuries known as the klibanaphoros, "bearer of klibanion" — named after the clibanarius and a throwback to the very heavily armoured cavalry of earlier days. However, the traditional view is that after the loss of prestige, men and material and the horse-rearing plains of Anatolia after they lost the decisive Battle of Manzikert to lighter Turk cavalry, they slowly dropped out of use. But according to J. Birkenmeier in "The development of the Komnenian army: 1081-1180", units of 'Kataphraktoi' (cataphracts) were still being used during the 12th century. The Komnenian restoration of the Byzantine Empire during that century created a new kind of Byzantine army, which is known as the Komnenian army. Yet it seems that the cataphract was eventually superseded by other types of armoured cavalry. The emperor Manuel I Komnenos, for example, re-equipped his elite cavalry in the style of western knights. It is difficult to determine when exactly the cataphract saw his final day. After all, cataphracts and knights both fulfilled a similar role on the medieval battlefield, and the armoured knight survived well into the modern age. The Byzantines called all heavy shock cavalry as kataphraktoi. The Byzantine army maintained units of heavily armoured cavalrymen up to its last years, while neighbouring Bulgars, Serbs, Russian states and other eastern European peoples emulated Byzantine military equipment. Contemporary depiction in the Liber ad honorem Augusti, of Dipold of Acerra, an early 13th-century knight, when the knight was undisputed master of the battlefield. In the early Middle Ages the rank of knight was loosely defined. In late Carolingian France (10th century) persons occupying this role were known by the Latin term miles (plur. milites). This term designated a professional fighting man in the emerging feudal system. Many were as poor as the peasant class. However, over time, as this class of fighter became more prominent in post-Carolingian France, they became wealthier and began to hold and inherit land. Eventually fighting on horseback became synonymous with the elite warrior caste. From the 12th century on, the term became associated to cavalry and nobility in general, and thus to the earlier Roman equestrian class (see esquire) as well as the Greek Hippei class. As the expense of equipping and maintaining a knight's equipment was beyond the ability of the primitive medieval state to support, the feudal system became more important as a means of securing the loyalty of knights to the king. Knighthood was a hereditary title, and was usually passed on by a father to his eldest son. All prospective knights were trained from childhood in the knightly traditions of chivalry as well as war. At the age of six, they first became a servant, or page, in another knight's or lord's household, where they learned etiquette as well as basic combat, and after a few years they became a squire, an apprentice and personal assistant to a fully fledged knight, responsible for maintaining the knight's horse and equipment, as well as arming him for battle. At this point he may choose to remain a squire or become a knight, though many remained a squire due to the restrictions and expense of becoming a knight. A squire was made a knight through a ceremony known as "dubbing" by their superior lord or king, swearing allegiance to his feudal masters, charity, and protection of other Christians, as well as respecting the law of the land. Unlike other forms of heavy cavalry, the medieval knights did not operate as a true military unit. Their mode of fighting (with the exception of chivalric orders such as the knights Templar and the knights of St. John) was essentially a 'free for all' of individual warriors. The Mongol heavy cavalry in a battle (13th–14th century). Muslim military advances in Sub-Saharan Africa relied heavily on armoured cavalry, playing a similar role to that in Medieval Europe. In China, heavy cavalry developed during the Qin and Han Dynasties. Heavily armored riders wielding lances became widespread during the Western Han era. Armoured cavalry, in which both soldier and steed are clad in complete armour, were employed since late Han Dynasty, and became widespread in the 4th century AD, where it was the main power of the armies of the northern dynasties of China, 4th century to 6th century. During the Tang dynasty, as the importance of lighter-armed cavalry and infantry increased and that of the armoured cavalry decreased, the horse-armours were seldom used. However, armoured cavalry were again used by the Song dynasty and its enemies including Jin, Xixia, Mongols, Khitans. In Korea, the earliest evidence of armoured cavalry is a mural painting drawn in the mid-4th century AD, Koguryo. Lamellar armours were used for both men and horses, with the soldiers carrying lances. Another mural painting of Koguryo shows an armoured cavalryman wielding his lance using both hands, unlike the couched-lance used by medieval European knights. During the Koryo dynasty bardings was still used, but how many barded heavy horsemen existed remains unknown. In the Chosun dynasty bardings were no more used, and the horsemen's main weapon was the bow. Lances and other close-combat weapons were seldom used effectively. However, starting from the 17th century at least, the Korean cavalry began to carry two-handed flails along with bows. Armoured cavalry, in the form of the Gendarme, was at its highest as a proportion of the total number of combatants in many Renaissance armies, especially in France. North-Central and Eastern Europe saw the emergence of winged hussars that proved a decisive factor in the territorial gains of Polish-Lithuanian Commonwealth and its wars with Sweden, Muscovy and the Ottoman Turks. Later, the cuirassier was the main form of heavy cavalry, beginning in 1484 with the 100-man strong regiments of Austrian kyrissers for the Holy Roman Emperor Maximilian. In the early 16th century heavy cavalry in the European armies was principally remodeled after Albanian stratioti of the Venetian army, Hungarian hussars and German mercenary cavalry units. A 1551 Venetian document describes that part of the English cavalry was armed in the Albanian fashion. Cuirassiers played a very large role in the Thirty Years' War and the related Eighty Years' War, particularly under the House of Orange and Duchy of Savoy. They represented the last gasp of full plate armor on the battlefield. They would have worn very distinctive plate armor, which typically featured very long and wide tassets, articulated leg protectors which would extend all the way from the breastplate down to the knees. The head would typically have been protected by a fully enclosed burgonet, of which the "Savoyard" style was one notable type. This rounded helmet, frequently featuring a stylized or grotesque face mask, was nicknamed "Totenkopf" or "Death's Head" by the German soldiers who encountered cuirassiers so equipped. The cuirassier's armor would have been exceptionally heavy and thick - sometimes up to eighty pounds - and would be expected to stop a bullet. A regiment of cuirassiers killed the Swedish king Gustavus Adolphus at the 1632 Battle of Lützen. The French introduced their own cuirassiers in 1666. However, the amount of armour worn by the cavalry of the European armies in battle had been substantially reduced, with even the cuirass often worn only to the front. By 1705, the Holy Roman Emperor's personal forces in Austria included twenty cuirassier regiments. Imperial Russia formed its own cuirassier regiments in 1732, including a Leib Guards regiment. The Russian cuirassier units took part in the Russo-Turkish War. Cuirassiers played a prominent role in the armies of Frederick the Great of Prussia and of Napoleon I of France. The latter increased the number of French cuirassier regiments to fourteen by the end of his reign, although they gradually declined in importance as the firepower and accuracy of the muskets and rifles of the infantrymen increased. The cavalry still remained battle-deciders though, with Napoleon maintaining several reserve cavalry corps to be employed at the decisive moment in battle to finally break the enemy formations with a devastating charge. From roughly 1650 to 1820, Spanish heavy cavalry fought Apache warriors in North America. Several small battles occurred; most of the time the Spanish lancers were outnumbered severely but still managed to defeat Apache armies, hundreds of men strong. The climax of these conflicts occurred in the region of present day Tucson, Arizona in the United States in the late 18th century in Spanish Arizona. The last time cavalry of both sides wore a cuirass in battle was during the Franco-Prussian War of 1870. The Imperial German and Russian cuirassiers subsequently discarded this armor for all but parade purposes but the twelve regiments of French heavy cavalry still in existence in 1914 wore their cuirasses on active service during the opening stages of World War I. Although some heavy cavalry regiments have remained into the 21st century, their large mounts are today used solely for ceremonial duties, such as those of the Household Cavalry in the United Kingdom. Today the main battle tanks fill the niche of heavy cavalry. ↑ Downing, Brian (1992). The military revolution and political change: origins of democracy and autocracy in early modern Europe. Princeton University Press. p. 66. ISBN 0-691-02475-8. http://books.google.com/books?id=jpYnGxR5MuwC&pg=PA66&dq=stradioti+%2B+Albanian&hl=en&ei=qhV9TNy3EZGZOOC8mIIE&sa=X&oi=book_result&ct=result&resnum=3&ved=0CDAQ6AEwAjgK#v=onepage&q=stradioti%20%2B%20Albanian&f=false. ↑ Cornish, Paul (1987-11-26). Henry VIII's Army. Osprey Publishing. p. 33. ISBN 978-0-85045-798-8. http://books.google.com/books?id=ESNAW9gg8TMC&pg=PA33. Retrieved 28 October 2010.